Jump to a section: Buyers, Sellers, Mail, Ratings, Other. How do does this work? 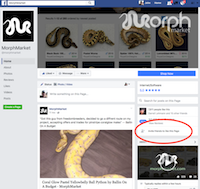 Since MorphMarket does not directly sell or ship any animals, you must find a breeder on our site who exports to your country. To see if a seller can export to you, visit their Store Page and look for your country under delivery options at the top. When searching ads, you can filter search results by countries exported to using the advanced search. Make sure to check the different MorphMarket regions as the search only looks within a single region. You can change regions using the flag in the upper left corner of the site. How do I find an animal? Search: To search, simply type into the input at the top of the page (or in the mobile menu). For example, try "adult male pastel". It understands gene names, as well as some other terms like "male", "subadult", and "proven". By default it shows available items, but "sold" or "all" will include historical data. Ads can also be located directly by id by prefixing with the # sign as in "#1234". Advanced Search: To perform more specific, guided searches, click the on the right of the search input. This provides many additional options for searching and sorting. The advanced options will be retained between searches, but will only be used if this window is shown when the search is executed. Why do you allow ads without pictures? First, we totally agree on the importance of pictures. Morphs are about the visual appeal, and why would you buy something that you can't see. Of course if you are interested in such an ad the first thing you should do is to request a picture. For that reason, our ranking algorithm always puts ads without pictures in last place. As soon as you hit ads with pics, feel free to treat that as the last result page. In this way you aren't wasting any time. Realize that the alternative is not more ads with pictures, it's just less inventory for you to search. Sometimes in a breeder in the craziness of hatching season may not have had time yet to take pictures. We believe the average buyer who is hunting for a very specific morph will be happier to have access to this listing than nothing at all. That's why we think the ranking penalty is the best overall solution. If you think differently, let us know why! Why are some prices black and some green? Black prices indicate that the ad has been renewed and generally listed for a longer time. Green prices indicate the ad has not been renewed before. I want to report an ad to MorphMarket for some violation. There is a "Report" link below the picture on an ad which you can use to flag it for MorphMarket's review. Please follow the directions there, as this is only for flagging scammers or spammers. For ads on animals which are no longer available, you will receive a survey several days later where you can indicate this feedback for MorphMarket and the seller. For ads with incorrectly tagged genetics, please inquire to notify the seller first several days before flagging. Can I search for sold reptiles? By default results show currently available reptiles "for sale". To see more historical results, choose "sold" and for the maximum number of results choose "all". These options are available in advanced search and also in the gene index. What if I have problems with a seller? As stated above, MorphMarket's job is to help you find a seller with an animal you'd like to buy. We cannot control the behavior of the seller. Do your research (use our tips) and buy from sellers with strong reputations. MorphMarket assumes no responsibility and provides no guarantees for the claims or actions of any buyers or sellers on the site. That being said, we are very passionate about seeing you get the best customer service from our sellers. Several days after you send an Inquiry you will receive a very short survey which will give you an opportunity to let us know of any problems. We do not need to be made aware of problems before this time, as they usually work themselves out. We appreciate this feedback! Patterns of issues with sellers will be addressed. What do MorphMarket memberships mean? MorphMarket members are sellers who have purchased a membership to support MorphMarket and gain additional selling features. The different levels of membership can be seen on our pricing page. Generally speaking, sellers who have purchased memberships are more established and vetted than those who have not and membership should be weighted as a positive factor in your selection process; however, as mentioned above, MorphMarket does not assume responsibility for the actions of any seller on our site. Who is a Founding Member? A Founding Member is a seller who purchased a membership in 2017 when we first created memberships and has maintained their membership since that time. We are grateful for the support of all members, and especially those who have been consistently supporting our site since the beginning. Most of our help specific to our Sellers is located in the Seller's Guide. You can find much of that same information in our Seller Video Tutorials. Who can list items for sale? Anyone who's fair and honest. You don't have to be a breeder or have a registered business. How do I sell on the site? Read our Start Selling quick start to get a seller's account created and approved. Read and/or watch the video tutorials in the Seller's Guide for more details. Where's my new ad that I've created? Use these tips in the Seller's Guide to troubleshoot. What about a gene your site doesn't know about? MorphMarket actually knows far more genes than show up on the Gene Index page. To test if MorphMarket knows the gene, trait, or trade name, type it into the search box or into the calculator. After submitting, if it displays that name in a colored bubble, it's a recognized but there may be none for sale at this time. MorphMarket does not attempt to recognize every single gene ever discovered due to the very large number and every growing set of these mutations. Our normal policy is to try to represent a gene if there are at least two sellers of the said gene on MorphMarket. Exceptions may be made at our discretion, especially for substantially non-normal/pastel-ish looking appearance. If you would like to call a gene to our attention, please submit Feedback with the the gene/trait names(s), their properties (e.g., recessive, polygenic, etc. ), if they are allelic/in a complex with other genes, and links to evidence that this is proven out and/or accepted by the community. If accepted, it will be added with the next batch of new names. After the gene is added to MorphMarket, for any animal with that new gene and other previously known genes, you will need to add the gene back by hand. This is because we don't try to reprocess ads that you have already hand-validated. NOTE: We reserve the right to change the set of genes recognized by the system at any time. This is a complex issue and one that many parties have vested interests in. We will do our best to create the best system for everyone, but it will be impossible to meet everyone's desires. You can still list ads even if they have some unknown genes. Users can still discover these ads via other known genes, searches, 'latest ads', our newsletters. Just follow the normal process and make sure the gene name is in the title (like usual). In addition, you may add the "Other" gene tag to this animal to indicate it has additional specific gene(s) for which we don't have a category. Why doesn't my heterozygous animal up? Genes refer to a genetic characteristic such as albino. Traits refer to a specific expression of this gene such as het albino, possible het albino, or visual albino. A gene search will return any animal with the albino gene, whereas a trait search will only return the animals with that type of expression. Gene index: by clicking het albino, or by clicking the label "albino" (all albinos). Basic search or Advanced Search: by typing "het albino", "100% het albino", etc. To facilitate reliable communication between buyers and sellers, MorphMarket has implemented messages as a 2-way email relay. Inquiries from buyers are sent to sellers in email where conversation continues. These messages can also be viewed on our website. This process allows us to make sure that seller both receiving the inquiries being made as well as responding to them. It also helps us protect everyone against spammers and other abuse. From a specific ad page, click "Inquire" to create a conversation with that seller to ask questions about that animal or find out how to purchase. This will send them an email. You will get their response in an email and it will show up in your Messages page as well. How do I respond to a message from someone else? You will receive an email with that message. Just click reply. You can also view and send messages on your Messages page. Why does the email address that I'm replying to look strange? When you click reply to a message, you should see an address like: . This is correct and is the unique identifier that will route your message to the other party in this conversation. The actual direct email of the other party is not initially shown in order to reduce confusion on how to reply, however after the seller has replied once, the actual emails are revealed on the Messages page. Why did I not receive emails for the messages that I can see on the website? If you see messages on your Messages page, for which you have not received emails, they are most likely being blocked by your email provider's spam/junk/promotional filters. Find the missing messages by searching the folders in your mail program to find the messages. Search for the phrase MorphMarket (one word) in your Spam/Junk, Promotional, and any other folders where it might have landed. Make sure to check using your computer and not just your mobile phone. Multiple users have reported that the junk folder on their mobile phone was empty, but they found our email in junk when using their Computer. Once you find the messages, mark them as "not spam" and move them to the correct folders to train your program. Reduce or eliminate this problem completely by adding MorphMarket's email addresses, most importantly to your address book. Why as a seller am I being told that I did not respond when I did respond? If a reply is not sent back through our system after several days we will send the seller an automatic message to remind them. Each inquiry by a user on a different ad should receive a unique response, even if it's something brief like "already responded", if say, several inquiries came from the same user. Please see this page on this error. Can I send attachments with the messages? You can attach up to 20MB of attachments to the emails sent through our system. The Messages page will show that there were attachments, but you can only access them in email. You can find more information about this system in our Seller's Guide. If that still doesn't answer your question, please send us feedback. I have questions about the care and feeding of my animal. First, get help is from the breeder who sold you the animal. This service is part of what you purchased when you bought from them. Second, check our Resources page where we've listed the best communities on the internet who specialize in these topics. Can you help me identify my morph? Believe it or not, this is not our expertise, but we know just who to point you to. Check our Resources page for links under Morph Identification. These groups can help you figure it out. Please visit our Ratings Guide. You can find common Q&A at the very bottom of that page. When will you add some other species of reptiles? We are adding new species every month. The best way to vote for a new species is to add it to your Category Interests. Breeders can create an account to access some species that have not yet been released to the public. Does MorphMarket support support non-US? Yes. We have already released MorphMarket Europe and other regions will follow. Breeders can specify their country and advanced search allows limiting search to a specific country. As non-US usage becomes popular, more advanced geographical search and currencies will follow. Some breeders also export. Why do you require users to be 18 years old? Our Terms of Service require that all buyers and sellers on our site be 18 years old because minors lack the capacity to make a contract in the US. If you under this age, find an adult who is willing to create an account and make purchases on your behalf. We rolled out membership to US Ball Python sellers in Spring 2017. See our pricing page for more details. Read more. I love MorphMarket! How can I support it? Thanks for asking! MorphMarket will only get better as more users join, so if you like us, tell your friends what you think about us. Nothing is as powerful as your testimony. One of the best ways to help is to invite your friends to like our Facebook page. Just visit MorphMarket's page and click the "Invite friends" (located where the red oval is). Another thing you can do is to reshare our posts with your friends and follow and retweet us on Twitter as well. We notice and appreciate it! Where's the best place for me to engage MorphMarket? Your feedback is so important to us. This is an evolving product and you are helping to shape it. We are regularly giving updates on our Blog and you can leave comments at the bottom. The MorphMarket Facebook page is also a good place to engage. Public conversation will promote collaboration better than isolated, one-off conversations. Send private matters through the site's feedback form. How do items show up on the site? Most breeders post ads directly by importing their inventory from a spreadsheet. Others ads are aggregated from websites by MorphBot. MorphMarket is a Responsive Web App, which means it's designed to be great on mobile, tablet and desktop. People asking this question are usually encountering some kind of missing feature or usability problem. Please let us know if specific areas of the site feel difficult to use on your phone so we can improve it. We plan to evolve into a Progressive Web App which is next generation technology that combines the benefits of an Native App and Responsive Web Apps. This means over time you will begin to see more app-like features like having an Icon on your Desktop, and receiving Push Notifications, without ever installing software. If you're interested, here's more reading . We are not raising additional funding at this time. However, we'd love you to send us an email and introduce yourself.